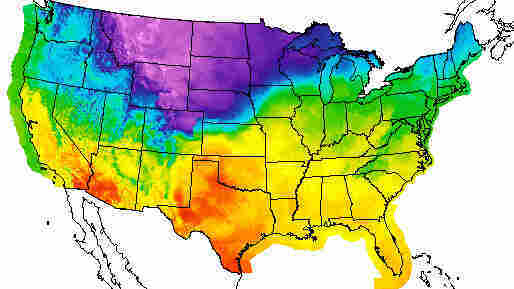 Arctic Front: Blast Of Cold Air Hits Middle Of U.S., Heads East : The Two-Way The cold front hit Wyoming just after midnight. It struck Denver this morning, bringing wind and snow — and reportedly dropping the temperature by 15 degrees in just 15 minutes. Some forecasters call it an arctic front. Others say it's the good old polar vortex, or simply an "intrusion." By any other name, it'll be just as cold: Weather that hit Alaska last week is rushing down into the U.S., rapidly bringing a drop in temperature that won't end for days. "Significant snowfall is likely for parts of the northern Rockies, northern Plains and Great Lakes region as the cold front moves southward," the National Weather Service says in its latest advisory, adding that winter weather advisories are in effect. The cold front hit Wyoming just after midnight last night. It struck Denver this morning, bringing wind gusts and snow — and dropping the temperature by 15 degrees in just 15 minutes at the Denver International Airport, according to local weather news site Weather 5280. The site says that an autumn morning that began at 62 degrees had fallen to 37 degrees less than two hours later. Other states, such as Montana, North Dakota and South Dakota, saw anywhere from 3 to 14 inches of snowfall from Sunday morning to Monday morning. The NWS office in Lincoln, Ill., is advising anyone who's in the path of the winter system to get outside today, saying that the weather will be nasty later this week. The service says there's at least a 50 percent chance that areas of Minnesota, Wisconsin and Michigan will get more than a foot of snow. The winter weather system is made up of the remnants of Typhoon Nuri, which hit Alaska last week. Now it's making its way south, where it could bring unseasonably cool weather for days. An NWS animated map of the storm's spread resembles a cold cast net being flung down over the central and eastern U.S. The NWS Ocean Prediction Center posted a video that shows how Nuri transformed into the current system, describing that process as "a rapidly intensifying post-tropical low that ultimately deepened to one of the strongest known Northern Pacific cyclones on record."